The 10 Best Ellipticals With Power Incline – Get Ready To Crank Up The Intensity! Ellipticals, like all home fitness equipment, come in all shapes and sizes and with varying included features. Ellipticals with power incline are always a smart choice because you can get a little extra burn when you want to. Changing the incline setting also lets you target specific muscles in your legs, giving you more control over your workout. Not all ellipticals offer incline. The ones that do can have either manual or power incline settings. We will briefly go over both, but the goal of this article is to show you what you should be looking for in your power incline ellipticals. I will also review the top incline ellipticals that are available today. Precor EFX 447 Elliptical Machine – Highest Incline! AFG Sport 5.9AE Elliptical – Best Budget Option! Yowza Fitness Miami Elliptical Trainer – Most Unique! Bowflex BXE116 Elliptical – Best For Tall Users! Years ago you only found incline options on the commercial ellipticals. Now, fortunately for us, most home ellipticals are coming with incline options. That said, not all inclines are the same. Ellipticals for home use can have manual or power inclines. Having a manual incline means that you have to get off of the elliptical and “manually” set the incline. These machines typically have 3-6 incline settings and once you set it you are stuck with it until you want to get off the machine and set it again. This is frustrating if you want to do intervals or switch between inclines often. Really, the only benefit to a manual incline is the cost. These machines are significantly cheaper. When most of us think about ellipticals with an incline setting we are thinking power incline. These are the ellipticals where you simply push an arrow up or down to adjust the slope. These machines are much nicer, and more expensive than the manual incline ellipticals. Ellipticals with power incline features are great because you can switch between different incline settings as much as you want without having to stop your workout. These work well for interval or HIIT workouts. Some ellipticals even have “one-touch” buttons that will instantly set your incline to a given angle without having to push the up button until you reach your desired setting. If you are looking for an elliptical that has incline, the first thing you need to do is make sure the elliptical actually inclines. Because not all of them do! Even some of the high-end models don’t incline. Don’t assume all nice ellipticals have incline options- most do, but some don’t. All of the ellipticals included in this review do by the way. 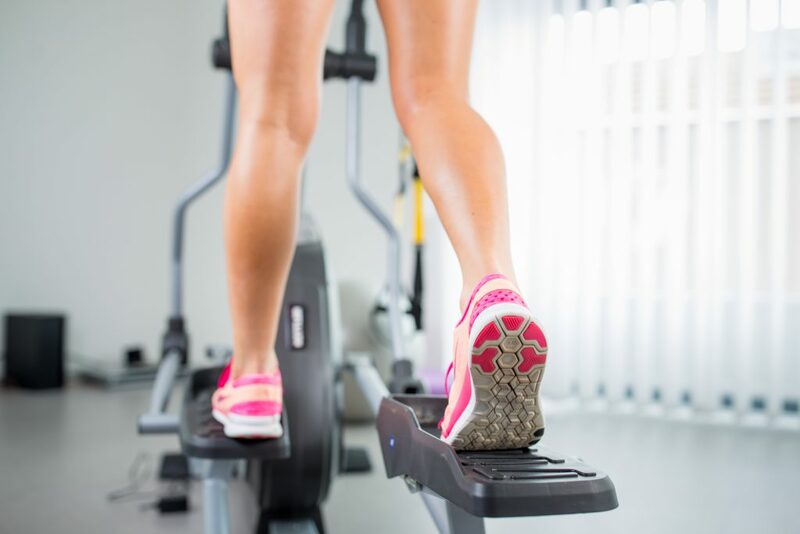 Stride length is hands down the most important factor to consider when choosing an elliptical. Stride length is the distance between the pedals during use- it’s how far your legs are moving front to back, or how far your feet are stretched apart when you step. I can’t think of any other ways to describe it, I hope you get the idea. This is crucial for comfort. If the stride length is too short, you aren’t going to be able to stretch out and find a comfortable gait pattern. If the stride length is too long (this is less common), you are going to feel like you are having to stretch out too far to use the elliptical. Nicer machines have longer stride lengths, budget machines have shorter stride lengths. This is the general rule, but there are exceptions of course. Budget ellipticals tend to be in the 12-16″ range. Nicer machines are in the 18-20″ range. 20″ is normally considered the optimal stride length- this length fits most users comfortably. If you are over 6′, you shouldn’t consider anything less than 20″. Weight capacity is always one of the first things I look at when considering exercise equipment. It gives you an objective value for how well built the product is. You obviously need to check this to make sure it is safe for you to use your chosen elliptical. Higher is always better. Try to find an elliptical with at least a 300 lb weight capacity. Even if you are well under that weight, this tells you the machine is designed to withstand higher forces. High quality ellipticals should have weight capacities between 300-400 lb. It’s important to consider console features as well. These are purely subjective and everyone has their preferences. Some ellipticals will have more high-tech features like bluetooth compatibility. You may want to find an elliptical with bluetooth if you use fitness apps to track your data. Most ellipticals with power incline will come with telemetry (wireless) heart rate capabilities. Some will include a chest strap monitor, others won’t. All ellipticals with power incline will have grip heart rate monitors. Touch screen consoles are another feature you may be interested in. Sizes vary, ranging from 5″ to 10″. Some screens have HD displays and are equipped for iFit and other fancier workout apps. Water bottle holders, fans, tablet holders, and media shelves are examples of other common features you will see. Features will vary depending on your price range. While not essential to your workout, these additional features can make using your new elliptical more entertaining. Diamondback Fitness is well known for their high-quality exercise bikes, especially the 510Ic spin bike, which I personally own and love. The 1260Ef is the only elliptical they produce and it has been named a “best buy” for 8 years in a row- maybe they should start making more ellipticals? Just a thought. Anyway, the 1260Ef made my list because it has 10 levels of electronic incline adjustment. At the highest level, you will be at 28° of incline. The higher the incline, the more your glutes, hamstrings, and quads are going to have to work. The higher incline angles are going to more closely resemble going up stairs. Besides the great incline settings, the Diamondback 1260Ef comes with a 19″ stride length. This is going to be long enough for most users to feel comfortable while exercising. If you are over 6′, this might be a little tight for ya, so you may want to consider an elliptical with a 20″+ stride length. This elliptical has an impressive 325 lb weight capacity. Speaking of weight, this machine weighs a whopping 275 lb itself. The 1260Ef is built durable and you will appreciate this extra machine weight when you aren’t noticing any wobbling or movement during your workout. Just keep in mind this elliptical won’t be easy to move once it’s assembled. 13 preprogrammed workouts including manual, intervals, random, and heart rate. There are also customs workouts if you like to create your own routines. Overall, the Diamondback 1260Ef Elliptical Trainer offers a challenging incline system and great workout variety. It’s built tough and offers a generous warranty. This elliptical comes highly rated from users, I just wish the stride length was a little longer. Sole ellipticals have a way of making it to most “best of” lists because they are well known for their comfort and durability. The Sole E35 is their mid-range elliptical and I think it has the perfect combination of function and price. The E35 isn’t loaded with fancy high-tech features, but it has everything it needs where it really counts. We’re here to talk about incline ellipticals, so let’s talk incline. The E35 has 20 levels of powered incline available. With the touch of a button you can quickly set your incline level and go to work. The 25 lb flywheel will ensure your ride is smooth and quiet regardless of your incline setting. The E35 elliptical has a 20″ stride length, which is the preferred distance for most users. Another nice feature on this machine is the ability to adjust your pedal position. You can adjust the angle of each pedal to fit you more comfortably. Speaking of pedals, they are also oversized and cushioned to further increase your comfort. The Sole E35 has a max user weight of 375 lb. This is because Sole manufactures these machines with a durable steel frame and plenty of weight to reduce machine movement. They also back up their ellipticals with an impressive warranty so you can rest a little easier after making a purchase. Precor produces both home and commercial grade fitness equipment. The EFX 447 is at the top end of their home elliptical series and is comparable with many commercial grade machines. If you have the budget for this elliptical you will appreciate the gym-like feel. The EFX 447 is a beast when it comes to power incline. This elliptical has an adjustable incline up to 40°. For those of you who love to crank up the incline and blast your glutes, here ya go. The EFX 447 has a max incline that can go toe to toe with pretty much any home elliptical in the world. Besides the ridiculous incline, the EFX 447 also has 20 levels of magnetic resistance to push you to your limit. The smooth, patented Cross Ramp technology eliminates more impact through your joints than most other models. There isn’t any stride length info available for the Precor machines, but they seem to be large enough to accommodate the majority of users comfortably. The EFX 447 has a max weight capacity of 350 lb. This is impressive, but actually a little lower than I would have expected for a machine in this price range. The Sole E35 is slightly higher and the price is significantly less. That said, 350 lb is more than enough to handle most of us. The EFX 447 is built to last, something the warranty proves. The Precor EFX 447 is a luxury home elliptical that will give you the feel of a commercial machine. It has a power incline that can reach an astounding 40° as well as a grocery list of other high tech features. The biggest downside of course, is its price. XTERRA Fitness might not be as recognizable a name as Life Fitness or Sole, but their FS 5.8e elliptical should be. It combines function, durability, and cost to make a product that is here to compete with the big boys. If you are looking for an easy to set-up elliptical without having to worry about some of the higher-tech features, this might be the elliptical for you. The XTERRA 5.8e Elliptical Trainer has 20 different incline settings available to you. This offers you a wide range of slopes to mimic nearly any type of terrain you can think of. Having this many settings is nice because you can gradually increase or decrease the slope without having any drastic hikes. This elliptical also comes with a 20″ stride length for optimal comfort and range of motion for most of us. The pedals are large and cushioned as well to help reduce compression forces and keep the impact as low as possible. Something else that is nice about this machine is that the pedals are only 2″ apart- keeping them nice and close is another way to keep your gait pattern as normal and comfortable as possible. If they get too far apart it can put unwanted stresses on your joints. The FS 5.8e has a max user weight of 400 lb, which is higher than all of the more expensive models discussed thus far. This tells us how durable and well-designed this machine really is. This weight limit can match most commercial grade ellipticals. The XTERRA Fitness FS 5.8e has a lot to offer with its incline, resistance levels, and warranty. It’s lacking in the workout programs department (only 8 preset), but if you rarely use these to begin with you won’t miss them. This elliptical is priced similarly to the Sole E35 and is very comparable. You may not be familiar with the AFG brand, but it’s part of Johnson Health Tech that also owns Matrix, Vision, Horizon, and LIVESTRONG. Needless to say, these are people who know a little something about home fitness equipment. The AFG Sport 5.9AE is currently my favorite budget incline elliptical and I’ll tell you why. First of all, AFG has provided this elliptical with 20 levels of power incline. This might not stand out that much given the current company on this list, but this treadmill is literally half the price of some of these other treadmills (and a quarter of the price of others). This is a great find for the under $1000 price range. The Sport 5.9AE also has a 20″ stride length to accommodate the majority of users and a 23 lb flywheel to provide a smooth experience. Combine that with the 16 levels of resistance, and you should be set to get a great workout. This elliptical is a lot cheaper than the others, so we should assume a smaller weight capacity right? Wrong. The AFG Sport 5.9AE has an impressive 325 lb weight limit. Again, these numbers are more impressive than most of the other machines in this price range and should be plenty to hold most users. The AFG Sport 5.9AE Elliptical kind of has it all. Great incline, enormous workout catalog, and a great price. This elliptical even has something you rarely see on any fitness equipment- bluetooth speakers. This is brilliant and I don’t understand why more companies don’t include this wonderful perk. Yowza Fitness has taken the elliptical trainer and put their own spin on it. The result is a machine that is really in a category all by itself. The biggest difference is what they’ve done with the handles, but we’ll get back to that in a second. The Yowza Fitness Miami is a different type of machine, but it’s one that deserves a serious look at if you are looking for a quality home elliptical. Let’s start with the incline function. The Miami features a “rampless” incline, which looks pretty cool. This is the opposite of the Precor (and many other brands) style of incline. There is no ramp in the front that you see the rollers climbing- it’s all operated from the rear of the machine. This rampless system is capable of producing a max incline of 60%. I want to point out that 60% is not the same as 60°. For the sake of time, lets skip the trigonometry lesson- a 60% slope is roughly a 30° incline. Still very impressive. It will start to mimic the feel of climbing stairs at this angle. The Yowza Miami elliptical reports that it has an adjustable stride length- this is kind of true, but it’s related to the incline setting. As the incline increases, so does the stride length. This is a unique system that gives you more range of motion as the incline increases. At the highest setting, you are stretching out to a stride length of 32″. Just don’t think you can start out at 32″ with no incline- it’s closer to 19″ at the resting position. This elliptical has a 400 lb max weight capacity- it’s built like a tank and should be able to handle the larger users without any problems. That reminds me, I need to talk about the upper body handles! They don’t move back and forth like typical elliptical handles- they are separated from the foot pedals and they kind of rotate horizontally- it’s hard to explain, but it is designed to activate your core more than the standard movement. I encourage you to watch the video, you really need to see this thing in action to get a good idea of how it works. The Yowza Fitness Miami Elliptical Trainer is a truly unique take on a classic exercise machine. It’s loaded with high-tech extras that will make it easier for you to track your data and reach your personal goals. If you are tired of the same ol’ elliptical, you may want to give the Miami a try. It also comes with a great warranty. The Proform Pro 12.9 is a great example of what a mid-range elliptical can and should offer. With a good combination of workouts, features, and durability, the Pro 12.9 is always a smart choice. If you are already using iFit, than this elliptical might make sense for you. It’s priced to move, and that’s just what it does. We’re here to talk about incline ellipticals. The Proform Pro 12.9 has a power incline system that can reach a max incline of 20°. This is less than some, but still enough to offer a tougher workout experience and help you target different muscle groups. This elliptical does have the quick touch buttons to instantly set your incline or resistance level for extra convenience- this works really well for interval training by the way. The Pro 12.9 has a 20″ stride length, so it should be pretty comfortable to use for most of us. You can also adjust the foot pedals to find the right angle to fit your stride. Few ellipticals in this price range allow you this much customization. The weight capacity for this elliptical is 375 lb, enough said. Seriously though, I love it when home fitness machines are built tough, and the Pro 12.9 really is. It’s also designed for really fast assembly. According to Proform it can be put together in minutes (although some users would disagree). Overall, the Proform Pro 12.9 Elliptical is a wonderful choice. If you are looking for a dependable elliptical with a great incline system, this is a smart bet. It comes loaded with workouts, and if you are into iFit, you will have access to unlimited routines. I’m not sure how companies name these things, regardless, the Bowflex BXE116 is becoming one of the best rated ellipticals in its price range. This is another mid-range elliptical that is in direct competition with the Proform Pro 12.9. The BXE116 comes in at a few hundred dollars more, but it does have something under its sleeve to set it apart from the rest. The BXE116 has a max incline setting of just under 10° (15%). The incline on the BXE116 isn’t as high as some of the other machines on this list, but it is really easy to adjust with the quick touch buttons on the console. You can also adjust the incline from the moving handlebars which adds convenience to your workout. I’m a fan of the little touches, makes a big difference. This is the best elliptical for tall users on this list because it has an extra long stride length of 22″. And this stride length isn’t dependent on the incline or anything else like that. No strings attached. Just a long stride length perfect for folks over 6′ tall. That said, if you are shorter, you may feel like you are having to stretch out to far to use. The Bowflex BXE116 is boasting a max user weight capacity of 375 lb. This puts this machine among the elite home ellipticals in this category. Again, this elliptical is designed with larger users in mind. The big and tall folks can have a hard time finding comfortable equipment that fits, not here. Overall, the Bowflex BXE116 is an impressive home elliptical perfect for tall and large users. The incline settings are efficient and easy to use with added buttons on the handles. It’s also loaded with workouts, resistance levels and added features. I just wish Bowflex and upped the warranty to a lifetime frame. Nautilus has been in the home fitness game for decades and has definitely made a name for themselves as one of the premier brands. You may not realize this, but this company also owns the Bowflex and Schwinn names- yeah, some pretty heavy hitters. Regardless, the E618 is one of their higher-end home ellipticals and it has a lot to offer for a decent price. The Nautilus E618 has a power incline that can reach a max angle of 10°. This is on the lower end of the incline spectrum, but setting and changing this incline is a breeze with the adjustment buttons on the handles. You can also adjust the resistance from the opposite handle. Where the E618 is lacking a little in the incline angle department, it makes up for it with a 22″ long stride length. This is longer than most home ellipticals, especially in this price range. The E618 would be a great elliptical for you if you are over 6′ tall. This stride length isn’t adjustable, so if you are under 5’6″ you might find this stride length a little too long. To go with the extra long stride length, the Nautilus E618 comes with a 350 lb weight capacity. The E618 is very comparable to the Bowflex BXE116 in all categories, it just seems that the BXE116 tends to always win (barely). When you consider the same parent company owns both brands, I guess we shouldn’t feel too bad for the E618. Either way, 350 lb is still impressive for a mid-range elliptical. Wireless chest strap heart rate monitor included, a nice bonus! Overall, the Nautilus E618 is a nice mid-range elliptical with a ton of workout variety. It has plenty of extra customizable features to improve comfort during use. It is very comparable to the BXE116, both in price and function. If you want more workouts, the E618 might be a good bet. They both come with the same sub-par warranty. Last, but not least, is the NordicTrack C 7.5 Elliptical. Here is another elliptical from another well-known home fitness equipment brand. The C 7.5 is very comparable to the Nautilus E618 and the Bowflex BXE116 in terms of perks and features, although the C 7.5 comes in with a slightly cheaper price tag. The NordicTrack C 7.5 has a power incline that can reach an impressive 20° angle. This is higher than several of the more expensive machines mentioned earlier. If you are looking for as much incline as possible, this elliptical might be on the top of your list. To go along with the impressive incline, the C 7.5 offers a 20″ stride length. This is the desired length for most users 6′ and under. The 2 previous ellipticals have a longer stride length, so if you are well over 6′ they would be a smarter choice. The max weight capacity on the NordicTrack C 6.5 is 325 lb. This elliptical just barely squeaked by our 300 lb guideline, but it still made it. In terms of weight capacity, more is always better – when in doubt between 2 products, always go with the one with the heavier weight limit. The NordicTrack C 7.5 Elliptical offers a good combination of workouts, incline, and price. It’s one of the smaller ellipticals discussed on the list and it may be better suited for beginners. Intermediate and advanced users might out grow what the C 7.5 can offer. That said, this is a solid elliptical with a nice warranty. We’ve just looked at a lot of ellipticals and if they’re all starting to sound the same at this point, step back and take a deep breath. I know what you mean. But it makes sense for all of these ellipticals to look similar… these are all the best incline ellipticals out there. All of these ellipticals met the criteria we set for an awesome power incline elliptical. I recommend you find an elliptical with a 20″ stride length if you are under 6′. If you are over 6′ tall, you may want to find one with a 22″ stride length. I wouldn’t consider anything with a weight capacity less than 300 lb. Remember, when it comes to weight limits, more is always better. When it comes to console features it’s completely subjective. Determine which features are most important to you and try to find one in your price range that checks off as many of those boxes as possible. The most common features to consider include wireless heart rate monitoring, bluetooth capabilities, and touch screens. Speaking of price ranges, the prices on these ellipticals can vary greatly. If you checked the prices online, you will know just how much I’m talking about. But the truth is, in order to have a decent power incline system, you have to at least be in the mid-range level of machines. These are the ellipticals in the $800-$1200 zone. The high-end, luxurious ellipticals can range in the $3000-$5000 zone. Any more than that and you are probably looking at commercial grade ellipticals. Regardless of your price range, I bet you can find a great elliptical that will meet the majority of your needs. If you are stuck between ellipticals when comparing, don’t forget to look at warranties. A lot of these ellipticals have lifetime warranties on the frame, but the parts and electronic warranties can really vary. Higher-end machines tend to have better warranties, but you never know. Definitely something to consider when making a purchase. That about does it. I hope this guide was helpful in your decision making. If you have any questions or comments regarding these or any other ellipticals, please leave them below and I’ll get right back to ya.